With the advent of antenatal ultrasonography, congenital anomalies, particularly of genitourinary (GU) origin, have become frequently identified during the prenatal period (Kim and Song 1996). Unilateral hydronephrosis secondary to UPJ obstruction and pelviectasis are the most common prenatally detected GU lesions, while severe hydronephrosis remains the most common cause of an abdominal mass in the neonate (Gris-com et al. 1977) (Fig. 8.5). The vast majority can be managed conservatively and evaluated as outpatients in the urology clinic; however, infants with bilaterality (in up to 20%-40%) or obstruction in a functionally solitary kidney, may present with oliguria or even overt renal failure (Murphy et al. 1984). Occasionally, these infants require temporary urinary diversion (usually in the form of a percutaneous nephrostomy) in order to relieve the obstruction and to allow for the appropriate nephrourological evaluation (Fig. 8.6). with documented obstruction and preserved function has been shown to be safe and effective even in the very young (King et al. 1984). Controversy persists regarding potential recovery in poorly functioning kidneys, with some authors documenting improved function following pyeloplasty (particularly in patients less than 6 months of age) and others showing little or even no improvement (Shokeir et al. 2005; MacNeily et al. 1993). Fig. 8.7. US demonstrating typical cluster-of-grapes appearance of left-sided MCDK consisting of a number of noncom-municating cysts separated by sparse, dysplastic parenchyma. The contralateral normal kidney demonstrates compensatory hypertrophy ple cysts of varying sizes separated by scant dysplastic parenchyma. 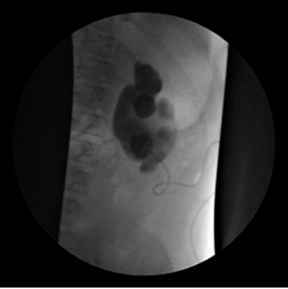 It is usually secondary to ureteral atresia and can be visualized as a number of noncommunicat-ing cysts or "cluster of grapes" on US (Fig. 8.7). Occasionally an infant with a very large MCDK may present with either respiratory or gastrointestinal compromise due to diaphragmatic or gastric compression, respectively. The diagnosis of MCDK mandates a complete GU evaluation because of the high incidence of contralateral abnormalities, including UPJ obstruction and VUR. Dimercaptosuccinic acid (DMSA) scanning will document no function on the affected side and VCUG will demonstrate VUR in up to 26 % (Miller et al. 2004). Fig. 8.8. 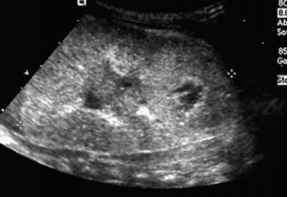 Postnatal US of a newborn boy with ARPKD. Note the enlarged, hyperechoic kidney secondary to innumerable microscopic cysts. This patient died within the 1st week of life due to pulmonary hypoplasia ble on follow-up; however, a minority increase in size (Oliveira et al. 2001). Both hypertension and malignant deterioration have shown very weak associations with MCDK; most investigators currently believe that these weak associations should not prompt the use of routine prophylactic nephrectomy for MCDK in an otherwise healthy child. However, nephrectomy is warranted for children who present with symptoms secondary to mass effect, enlargement suspicious for cancer, pain, infection, or documented renin-mediated hypertension (Kuwertz-Broeking et al. 2004). Although bilateral renal enlargement in the neonatal period is most commonly caused by bilateral UPJ obstruction, renal cystic disease is also responsible for a number of children presenting with massive abdominal distension. Autosomal recessive polycystic kidney disease (ARPKD) is a rare disorder with an overall incidence of 1 in 40,000; children typically present with massively enlarged hyperechoic kidneys on prenatal andpostnatal US(Zerres etal. 1998) (Fig. 8.8). Oligohydramnios leads to significant morbidity such as pulmonary hypoplasia, limb defects, and even Potter's facies. Hepatic fibrosis has also been associated with ARPKD and was previously thought to be inversely proportional to the degree of renal impairment (Landing et al. 1980). However, it has since been realized that both hepatic and renal involvement occur essentially independently of each other (Gagnadoux et al. 1989). The prognosis is generally poor, children surviving beyond the neonatal period universally require some form of renal replacement therapy (Cole et al. 1987). Although autosomal dominant polycystic kidney disease (ADPK) has a much higher incidence in the general population (1 in 500-1,000), it is usually first identified in older individuals on screening US (resulting from family history) or in those with hypertension, impaired renal function, proteinuria, or hematuria (Papadopoulou et al. 1999). However, when affected, infants usually present with massive renomegaly similar to ARPKD. Severely affected infants have poor prognoses; although associated anomalies, such as hepatic and pancreatic cysts, mitral valve prolapse and cerebral aneurysms, may manifest at any time throughout childhood (Ivy et al. 1995). Gradual replacement and destruction of renal parenchyma by growing cysts eventually leads to renal failure in the majority by the 6th-7th decades of life (Badani et al. 2004).